The waves have calmed a little, the Flax – Mill is back to weaving, the last holiday – making visitors have returned to their home countries. Time for a “look back and forward” and a few news from inside the textile – world, I think. Before I go to any details: A million thanks for the flood of beautifully worded mails, a number of nice cards and letters (we really love them) and for many phone-calls.The theme they all had in common was “thank you”. I’d like to turn this right round and direct our thanks to you, the people who made this truly memorable 25th Open Day and Yard Fest! I have attached a newspaper – article (click image for the pdf) which gives the – interesting I think – view of our event through the eyes of a local politician, one who knows what he is talking about may I say, he has been following our work here at the mill for quite a while. The piece ends with well – wishes “for the future”.Future of the Open Day?? Was the “silver anniversary” not the finale?? We did what we always do after the day – added costs and donations, “did the figures” as they say. The result: The event covered itself (just) one more time again! When we looked at the calendar we discovered that next year will see us 30 years as owners of the Flax Mill. 26 = 30! Would that and all the praise we got not call for Open Day and Yard Fest number 26?? Saturday, September 14th 2019 is the date for the 26th Flax – Mill Open – Day and Yard – Fest! Don’t say you didn’t know in good time! 15 of this year’s 20 exhibiting crafters have already asked us for a stall next year(without knowing what you read here now). In other words: The Open Day is almost booked up for 2019 – the event certainly has its own mathematics! During the run-up to the 25th Fest one of the dominating themes was the locally written song “The Ghost of Danny Boy” and German artist Isabel Neuenfeldt’s version of it. The response by our capacity crowd to her performance of it with Dearbhla Mc Taggart was jubilant to say the least. Composer Joe Kelly got it recorded at Flax Mill one day after the Fest. Sound – engineer Darrel Harkin turned up with his mobile equipment and “put it into the box”. There is very large interest in the song all over, Isabel will sing it for the first time in her home country during a gig next week. 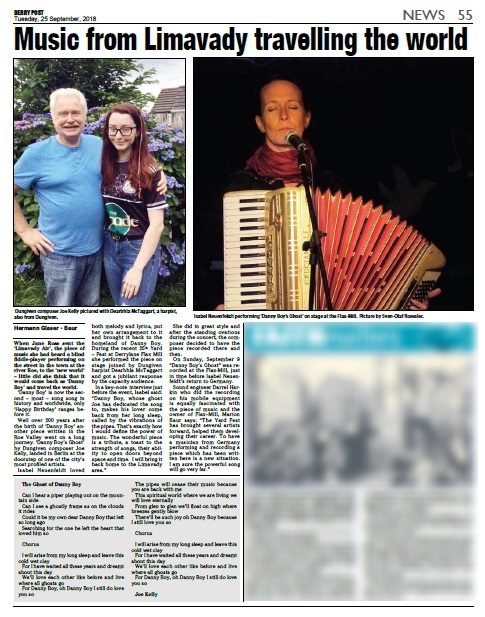 The “County Derry Post” carries an interesting article on this (plus a superb photograph of Isa on stage by Sven Olaf Roessler from Nordhausen) – see this page (click image for the pdf). From the production – line! All our efforts, not to run out of anything this year were in vain: Many people had to place orders for the traditionally woven tea – towels from natural linen with red or green stripes (we have added a few other colours) down the sides. After a few heavy extra shifts, we are in stock again – a sizeable order from England which came in two days ago leaves doubts about for how long though! Ladies Handkerchiefs in 3 different styles available now (some of them very soon)! Plain white hankies made from the bespoke linen we wove, using certified organically grown flax as a raw-material. Silk screen printer Charlotte Krone in England is running tests as we write this, the printed hankie will soon be back! 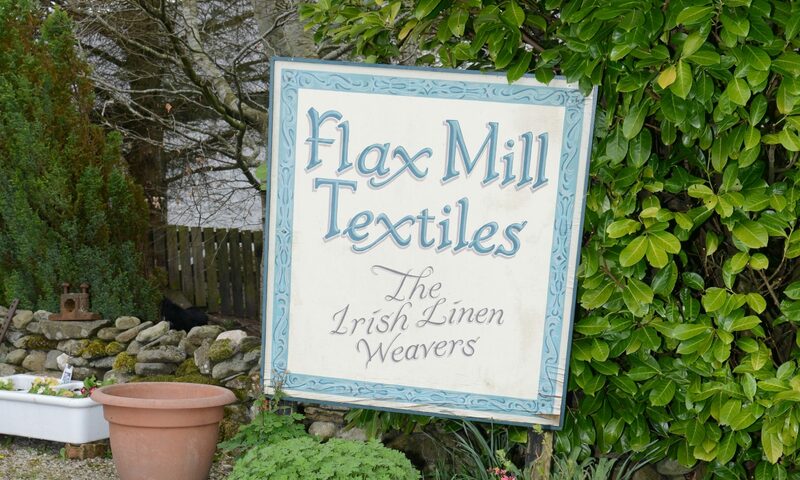 We asked her because she is attached to and very good with working on linen (see our web – site www.flaxmill.eu section “blogs”) and likes the fine lines. Hand-embroidered limited edition. The success of the “flax – flower – hankie” made me take the needle out again: Flax – flower on shuttle – loom – woven pure linen, where else would you get it! As with all handkerchiefs, numbers will be limited. It’s a lot of work to make the cloth, make the hankie and finish it to the detail we offer. 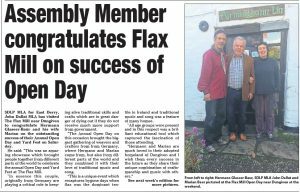 See you at Flax – Mill – sooner rather than later! Previous PostPrevious The blood – pressure is rising – last minute news before the 25th!